There's a reason I'm posting these Crunch Asiago Chicken Nuggets today, on September 5th. No, it's not National Asiago Day...or National McDonalds Day. Actually, it's my mom's birthday. I did not make these for her, nor did she recommend this recipe to me. In fact, I don't even think she knew I made it. However, I thought I'd post it today because of the recipe source: Jessica, from How Sweet It Is. You see, my mom has a bit of a blog crush, if you will, on Jessica. She recently discovered her, I believe through Stumble Upon (though we've made her recipes together before, such as the Crazy Feta), and now every time we chat, it's more about Jessica's recipes and Jessica's sense of humor and oh did you see what Jessica posted?! No, I'm not jealous at all. All kidding aside, because I'm really not jealous...I share that blog crush with my mom!...these crunchy little chicken nuggets are pretty dang delicious, much tastier, not to mention healthier, than what you'll get at the golden arches. We made these for Julia and Nate, my sister and her boyfriend, and she astutely pointed out that not a single nugget had one of those unidentified hard bits inside the chicken that you seriously doubt is a legitimate chicken piece! Happy Birthday Mom...I love you & I love that you read other food blogs that we can then chat about! Thanks for being my inspiration, my cheerleader, and my confidant! 1. 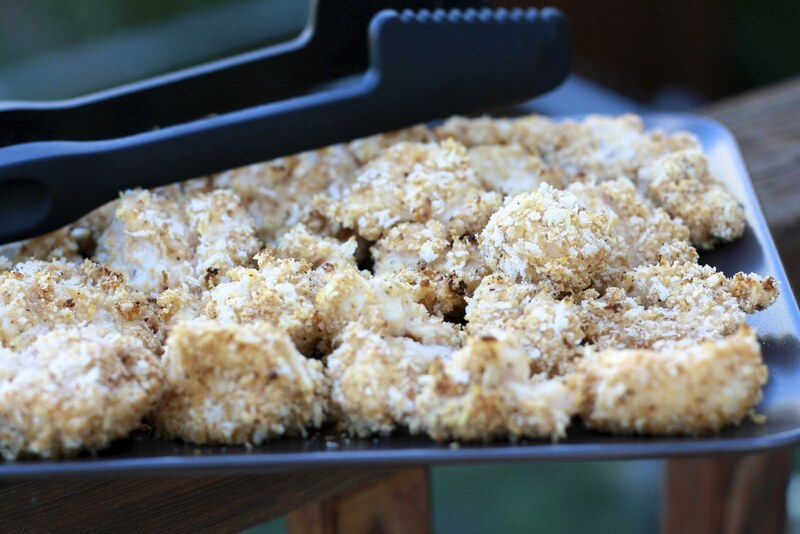 2-24 hours before serving, cut chicken breasts into nugget-sized chunks. Season with salt and pepper before placing in a bowl and pouring buttermilk on top. Cover and allow to soak for at least two hours or overnight. 2. When ready to bake, preheat oven to 450F. Line a baking sheet with foil and lay a wire rack, sprayed with cooking spray, on top of prepared baking sheet. 3. Add bread crumbs, flour, cheese, garlic powder, and paprika to a bowl and mix to combine. 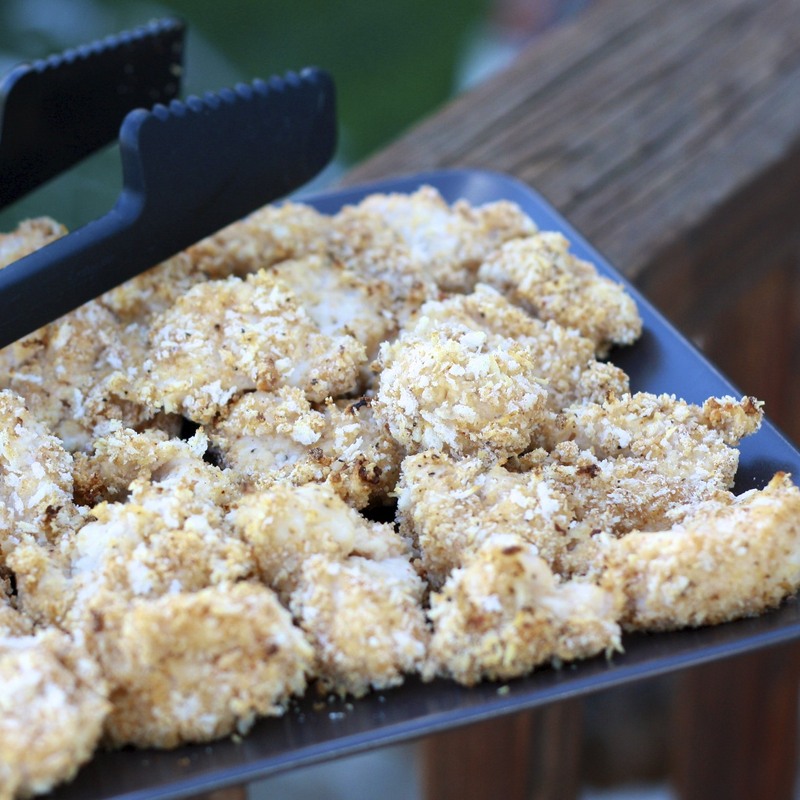 Remove each chicken nugget from the buttermilk and place in the bread crumb mixture to coat. Place on wire rack. 4. Continue with all chicken nuggets before lightly spraying all with non-stick spray. Bake for 7 minutes, then remove pan from oven, flip nuggets with kitchen tongs, and spray again with non-stick spray. Bake for 7 minutes more. Serve hot with desired dipping sauces.